First of all, the downtown square the monument occupies have been there for a long time, about two centuries. It was originally called Washington Square, named after George Washington. 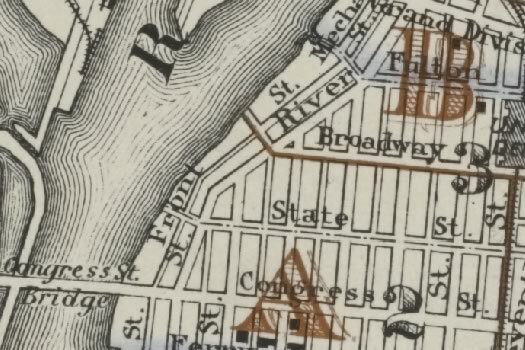 Even that triangular patch of land has been there for more than century, as you can see on the above map from 1881. Because of its central location, the square served as place for assembling troops, as well as a spot for sharing major news. "During the Civil War there was a crude building placed at the square that all of the killed, wounded, or missing in action notices were tacked to the walls of this makeshift shack," Rensselaer County Historian Kathryn Sheehan explained.Â "When the war ended there was a large bonfire to celebrate the end of the war." The story goes that during that bonfire, a group of men decided that they should form a group -- which became the Rensselaer County Chapter of the Grand Army of the Republic -- and should erect a suitable monument to honor those from Rensselaer County who served. Sheehan said on order to scrape together the money, the group raised money through subscriptions, bake sales, and kids had penny fundraisers. 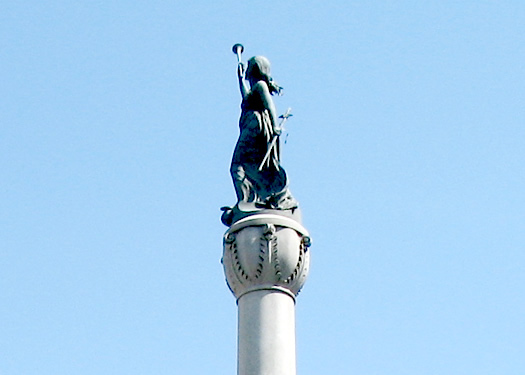 The resulting monument was dedicated as "The Soldiers and Sailors Monument," covered in symbolism and information. On each side of the base of the monument are four bronze relief panels, modeled by artist Caspar Buberl, who became known for his work on many Civil War monuments. "The relief panels reflect major engagements, the most famous being the battle of the ironclads, The Monitor and the Merrimac," Sheehan explained. Each side represents a different branch of the Union military service: the cavalry, infantry, and artillery, along with the naval battle. The plates were rolled in South Troy at the Rensselaer Iron Works. Atop the monument stands a figured titled "Call to Arms." The sculpture was designed by artist James E. Kelly of New York City -- who, like Buberl, became known for his work on war monuments. (Another bit about Kelly: He jumpstarted his career by designing a sketch and relief for Oscar Wilde's lecture tour of North America.) The figure is allegorical as she is facing true north holding her sword, with her foot on a cannonball. The Soldiers and Sailors monument has even more local roots. 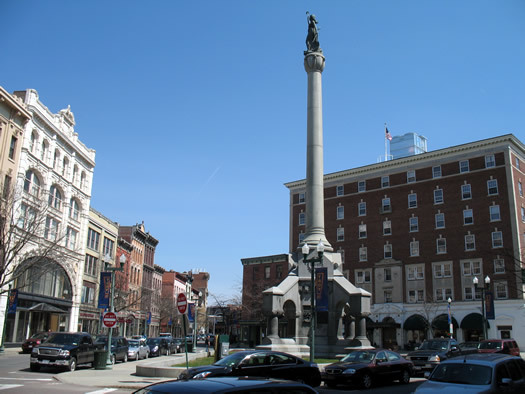 Architectural firm Albert W. Fuller & William A. Wheeler of Albany designed the monument. And the stonework was also supplied locally, by Adam Ross Cut Stone, which is still in business in Albany. The monument was officially dedicated in September of 1891, and thousands attended the unveiling. It was rededicated in 1991. Thanks for this lovely lesson on Troy history!